If the mundane astrologer is going to write about astrology and world events that have already happened or might happen in the future, let him do so from a historical sense. If this faculty is lacking, let it be cultivated. If he can’t cultivate it, let him study and learn from someone who has it. Anyone immersed in the astrology of history should be familiar with history’s great writings. History is not just fact and detail woven into a story. In its highest essence it is the distilled wisdom of the race. It is easy to observe an aspect, a Saturn transit, a synod, an ingress or a Full Moon. You may be able—with the help of an almanac—to skewer a phenomenon in the sky to an event on Earth. I have watched this carried out so often that it has made me embarrassed to call myself an astrologer. To peg an event to an aspect happening in the sky, without fitting it into its larger context, into the larger cycle, into its historical purpose and intent, that is a practice that should be forever banned from astro-history. The mundane astrologer’s historical sense is the gift for choosing important events and situations in the human story. Out of all the data—from leaders who make decisions, to cultural movements that affect millions, to scientific breakthroughs that raise a civilization to a higher level (or as did the development of iron weapons, which destroyed bronze based armies—the historian must consider the relative importance of events. Some people have a knack for choosing just the right events to depict the true meaning of an era; some must work hard to develop this faculty. Not just any random event can picture a civilization, describe a time, and delineate the transition of a people. Historians use balanced judgment, founded on value and philosophy—­they judge how an event fits into the context of history. The intelligence of judgment asks: Did this event affect large numbers of people? Did a decision by a lawgiver alter the flow of history? What event created change? The historian is always faced with such choices. For example, in 88 B.C. (Pl 15⁰ Taurus | NE 15⁰ Taurus), the elected Roman Consul, Lucius Cornelius Sulla, at the head of his army, involved in a de facto civil war, entered the city of Rome. He broke a centuries-old tradition and law that prohibited the army from entering the capital. This act constituted one of the important events that led to the collapse of the Roman Republic. This historical event still reverberates through our civilization. Sulla was an albino. This fact is interesting. 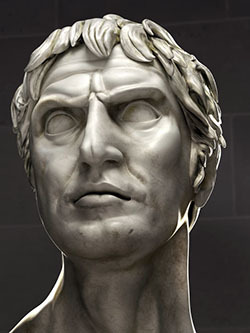 It was probably very important to Sulla, but it did not exert an influence on millions of people. In order of importance, the factor of his skin color ranks much lower than the fact that he took the consular army and entered Rome. Chart for the Cuban Missile Crisis. Click for larger image. During the term of President John Kennedy there were two events that affected the lives of millions of people. The Cuban Missile Crisis (October 22-November 2, 1962), was a nuclear confrontation between the two super-powers, the Soviet Union and the United States. It was a showdown. The Soviets backed down militarily. This brought about a general relative peace some historians have called pax Americana: No major super-power conflicts occurred during the next fifty years. The other event of great importance was the push by the Kennedy administration to place a man on the Moon—to open the frontier of outer space. The historical import of this effort is still incalculable. Both of these occurrences—using the most powerful war machine in the world at that time to force the Soviets to their knees, and employing the prosperity of America to land a man on the Moon—these are fascinating to the historian because they affected millions of people. Other facets of Kennedy’s public and private life may be of interest to the writers and readers of tabloid newspapers, but they are not as important. Benjamin Franklin is remembered by Americans as one of the Founding Fathers of this country. In the late eighteenth century, however, he was known in European scientific circles as The Electrician. He was one of the most distinguished scientists of his age. Benjamin Franklin. Clck for larger. If the historian were to write about Franklin’s influence on modern civilization, he or she might choose his experiments with electricity and magnetism that led to the use of electric power, one of the foundations of our modern civilization. Or would it be his role as a Founding Father, one of those few who sat at the table with Jefferson and Adams and edited the Declaration of Independence. As Pluto was exactly conjunct his natal Sun in Capricorn (just a few minutes off) that day (7/4/1776), as a mundane astrologer, balancing astrology and world events, I would judge that his work in the American Revolution and in the founding of America would carry the greater historical weight, as he was assisting at the birth of something new amidst the destruction of the old. THE FIRST LAW OF CONTEXTS: To connect an aspect that is happening in the sky to a circumstance, event or occurrence that is taking place in the world, the astro-historian must be familiar with that event’s past, significance and context. THE SECOND LAW OF CONTEXTS: The chart of an event must relate to the chart of another event. This law thus requires two charts, the chart for the act, and the chart for who or what is acted upon. Once the astro-historian chooses the event or series of events to weave into a story, he or she looks into the sky and observes the position of the planets in their orbit around the sun. The astro-historian must then translate these major events of history into the language of astrology. For example: A president is forced to resign in disgrace: This is a first event in the history of the United States. Is this an event of major importance? The exercise of power at the highest levels is undergoing a profound change. I judge this event to be pivotal. Now I try to arrive at a deeper understanding by determining a connection between what is happening in Washington and the configuration of the planets in the solar system. On August 9, 1974, when President Richard Nixon resigned his office, the planet Saturn by transit was exactly conjoined to the U.S. Sun (1776). 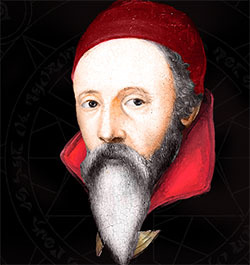 John Dee, astrologer to Elizabeth the First of England, and Galileo, astrologer to Lorenzo di Medici of Florence, were very successful astro-historians. In spite of the drawback of pre-­Keplerian mathematics and an archaic Ptolemaic view of the heavens, they were great astro-­historians, because they really understood history. When we moderns apply astrology to history, we do not succeed as well as either of these Renaissance astrologers. We may have better mathematics, better astronomy, but often our philosophical historical sense is non-existent. In the 1980′s there were two phenomena among the writings of astrologers that showed a misapplication of astrology to world affairs. First, that perennial prediction of a major collapse in the economy; a Great Depression was supposed to be coming. Clients all over America were advised to sell all their assets and buy gold. The financial collapse never occurred in that decade or many following it. Small collapses happened, but nothing ever like the Great Depression. I don’t think those forecasts were deduced from even the slightest understanding of the economic causes of the Great Depression. The other prediction, widely touted by numerous astrologers, was the resignation from office of another U.S. president. Sometimes it was to be President Reagan, at other times, President Bush. Then Clinton, then Bush II, then Obama. We were confidently assured that each would resign in disgrace. Well, it didn’t happen, did it? Interestingly, not even Clinton resigned in disgrace. Mundane astrology can add to the art of history, and we can more deeply understand the forces influencing it. As a predictive tool, it doesn’t seem to work very well.